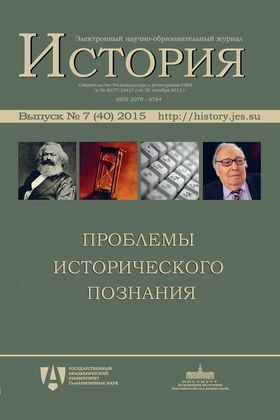 The annual issue devoted to philosophical, theoretical, methodological and logical problems of historical knowledge. The problem relating to the hermeneutics to the role of dialectic, to general problems of society in the horizons of being are examined. The great attention is given to inductive and deductive modeling in history. Theoretical problems of application of mathematical methods in the study of the Past are considered. The specific features of historical methodology and its connection with the modern non-classical scientific paradigm is analyzed. It is concluded that the archeological science may be presented as a paradigm. The roles of historical source and comparative methods in historical studies are stressed. The functional niches in political history are studied.